Fiction – Kindle edition; Smashwords; 160 pages; 2011. The first law of journalism is that something must always be found to fill the space between the advertisements. 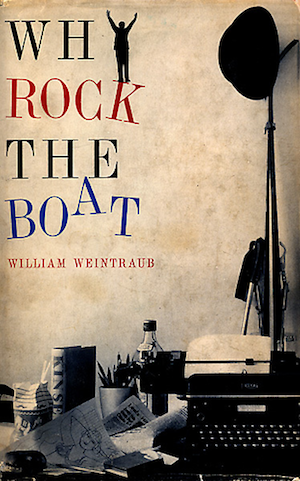 I love a good journalism novel and this one, by Canadian writer William Weintraub, fits right into that category. First published in 1961, Why Rock the Boat is about a rookie reporter, Harry Barnes, trying to make a name for himself on a Montreal newspaper that is in serious financial trouble. Harry hopes he can survive the constant rounds of lay-offs on the Montreal Daily Witness by making himself indispensable, but first he has to get off the general assignment beat (doing mundane jobs such as taking down the names of funeral attendees for publication) and onto the slightly more prestigious hotel beat (interviewing interesting guests). “This man was corned, loaded and pissed to the very gills,” Judge Elphege Boisvert said in Criminal Court yesterday as he sentenced Philip L. Butcher, local newspaper executive, to two years’ hard labour. Butcher, charged with drunk and disorderly conduct, was arrested Tuesday in the lobby of the Imperial George Hotel, where he had climbed up the big Christmas tree and, with obscene cries, was throwing ornaments down on passing citizens. Fortunately, Harry gets away with it, and an older reporter, whose career is on the slide, gets blamed — and sacked — for it instead. This sets into motion the pattern of the novel: a succession of blackly funny set pieces about Harry’s cheeky mishaps, all of which he somehow manages to get away with. Why Rock the Boat is set in the 1940s, but there’s so much about it that feels relevant today — almost 80 years on. It not only debunks the myth that newspapers were hugely profitable until the arrival of the internet and social media, it dismisses the idea that there was ever a “golden age” of journalism where ethics always trump the chase for profit. Public Relations, Erskine had told him in the car on the way up, was the coming thing. Reporters would eventually become relics of the past, with practically all stories “pre-written” by firms like Erskine-Gainsborough-Gotch and “tailored” to fit each paper’s needs. All of them, from the humblest Bellringers to the mightiest Rotary Club, would have their P.R. agencies to tell “their story” for them in a way that would create the best impression. Industry, labour, government, police forces, criminals, lawyers, churches – everybody would have their P.R. outlets to make sure the papers got things straight. Newspapers would just have a few editors to get the press releases ready for the printers. Eventually, Erskine said dreamily, the editors themselves might be eliminated and the press releases would go directly to the printers. What about reporters, Harry had asked. There would be no jobs for them. No, said Erskine, there would be plenty of work for them in the P.R. agencies, turning out the press releases. Perhaps the one element that makes the book seem slightly dated is the role of women in the media. As you may imagine, I highlighted a great deal of quotes from this book, because it’s so deliciously funny in places. No one is immune from Weintraub’s scathing commentary: readers (or “civilians” as he describes them) are dull and small-minded, advertisers are too easily offended, editors are bullies, newspaper managers are hypocritical and only interested in money, not a free press, and reporters are cynical and manipulative. There’s some terrific characters in it, including Philip Butcher, whose role on the paper is two-fold: to keep news out of it and to fire reporters whenever he feels like it, and Scannell, the City Editor, an anxious man who “showed an un-Witnesslike interest in the actual content of the paper”. While the romantic element of the story is a little clichéd — young male virgin tries to impress beautiful colleague by doing and saying things that aren’t exactly true — in the grand scheme of things it doesn’t really matter. This is a fun story with plenty of belly laughs and it makes a worthy addition to my collection of novels about journalists and old-time journalism. This is my 12th book for #20booksofsummer. I bought this one in January 2012 after I’d seen a review by the late KevinfromCanada. We both shared a love of newspaper novels, so as soon as I saw this one on Kevin’s blog I knew I had to buy it! When you look back it’s astonishing how many newspapers there used to be. I was a journalist cadet for a while, $40/week, went back to truck driving. It sounds rather good. I can’t say I’ve read a lot of novels about journalists/journalism. It’s quite common to think the newspapers did well before the internet. I actually thought so too. You do make a very good case for it. I’m rather glad now that I have a copy, at least it means you aren’t adding to my TBR pile! Actually, it’s good to hear that this is worth reading. I’d seen Kevin from Canada’s review years ago but I’d forgotten how funny it was supposed to be. A good one for a flight possibly. It’s a quick read, Max, and it’s so delightfully funny in places you’ll whizz through it.